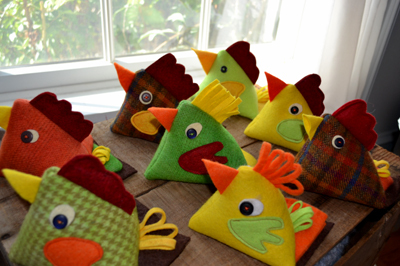 A sneak peek at my new felted wool chicken pincushions. At last a chance to breathe and write, they are synonymous to me. Too many things to do lately! Here we are, right on schedule or so I think and then our upstair's toilet and adjoining pipe let loose! It is an experience that demonstrated that my husband doesn't have the temperament to be president! Moans, groans and too many expletives spewed forth from the upstairs bathroom! 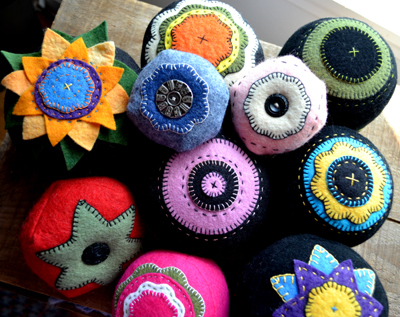 Some of my new 2-toned wool pincushions. Then a trip out to buy a new toilet on the night of the first presidential debate proved that it was a good thing that my husband wasn't planning on watching it! He has bigger real-life issues to deal with, and he doesn't seem to mind that he's just disqualified himself to be a write-in contender in a year where a write-in candidate just might win! Taking care of Little House is job enough, and being at war with a flooding bathroom threw him into overload along with being our Secretary of Finance! "This is what we have savings for," I assured him though little did I know then that I would soon be advising him to call a plumber! "Likely that is what Trump would do", I thought to myself, not saying it out loud. My husband hates politics! Lyme Disease and a stroke have earned me the privilege of being cared for, though today I am assigned to "the bucket brigade". It's the least I can do as I take my leisure. It's a self-appointed PJ Day for me, along with finishing my pincushions. Upcoming craft sales will be here soon. My first will be at Jon Katz and Maria Wulf's Bedlam Farm Open House, October 8th and 9th, 2502 State Route 22, just five minutes north of the town of Cambridge, New York. It has become an annual fall event and a chance to be outdoors on Columbus Day Weekend in what will hopefully be peak fall colors and comfortable weather. It will be a nice gathering featuring farm animals, poetry readings, craft show and demonstrations. 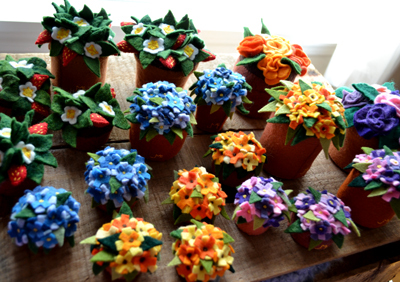 Red will be there to herd sheep as well as greet guests along with Maria's dog, Fate. .
My new flower pot pincushions. I offer my pincushions and display ware and Maria and Jon offer their animals, and bit of countryside to share with an interesting collection of friends, near and far along with all sorts of writers and artists gathered to share their talents and pleasure. We will enjoy this fun event with them and by then we will be celebrating our new plumbing as well! Indeed there is much to look forward to! My husband and I just talked about taking a quick escape after their Open House to go to the New Hampshire /Maine coastline to catch a bit of relaxation at the ocean, a seafood dinner and visit one of my favorite quilt shops, perchance to sneak a peek at a long arm quilting machine. I have a couple of quilting set-ups of my own for now... and likely forever! 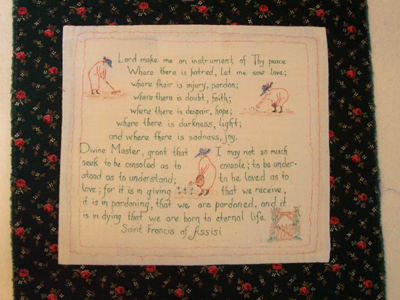 My mother instilled in me a love for good, old-fashioned, hand-done needlework and quilting, which will likely save us thousands of dollars, though I still dream of a fancy long-arm quilting machine, seafood dinners and functioning toilets!! Life is good and I look forward to another craft sale season. We will have only two more craft shows after Maria's, both scheduled in November and I will keep you all posted as to their whereabouts and times. 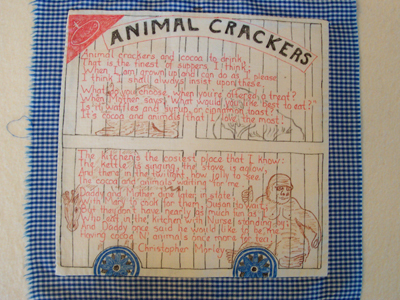 And there will soon be more of my wares listed in Little House's Etsy Shop. I am learning that balance in life is everything-- a bit of craft work and sales and back to quilting, quilting and still more quilting. That is balance to a quilter! You will note that I didn't list housecleaning or cooking! 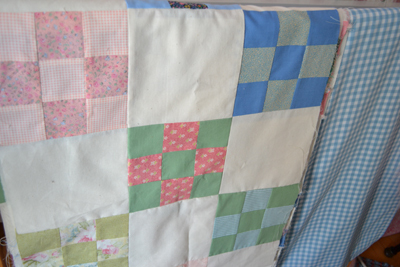 I have two quilts to finish before the end of the year, God-willing and no more catastrophes befall us. 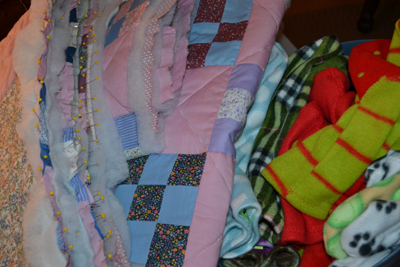 A utility quilt to finish soon and 100+ pair of fleece socks yet to tag for sales. 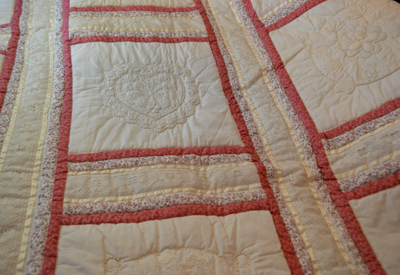 This quilt is now quilted but the back-side dedication is still left to do. Appliqued dedication to go on back side of friendship quilt. There will be lots of political news as I keep my fingers busy stitching. Election drama is proving to be more exciting than old-fashioned jousting tournaments and likely equal in blood-letting! America deserves the best leadership and what a grueling battle our contestants go through to prove themselves worthy. It is not a sport for the faint-hearted, but then I have to think how much talent it takes to be sure the plumbing in the big White House is working, not to speak of the plumbing of the country and the wide world as well. As for Little House, we will content ourselves to simply vote for the candidate of our choice and support him or her with our prayers! I do ask myself "who in their right mind" would sign up for the job of being president of the U.S.A. But as I thought that, clarity of mind appeared-- no one "in their right mind" would! Insanity mixed with a bit of humor is good at all levels of leadership! Perhaps I should run for president? My Lyme brain and experiences managing crises are but perhaps "preparation for what is yet to come", and besides, I think I have the right temperament! Keeping my cool when those about me are losing theirs? Tell me, is there a U.S. Department of Sanitation with expert plumbers to clean up world-sized messes or would such "cleaner-upers" be under the Department of Interior instead? I will have to research that answer, but wait... don't all presidents need some on-the-job-training? It is not by accident that our toilet broke the night of the first presidential campaign of 2016. I think it was providential! I had never before considered my potential talents that might make me suitable for the presidency: stitching-up everything in sight, keeping up with current events on TV and managing home crises, including big messes, and possessing a little insanity and humor...I could well be the winning write-in candidate for this election, with a little support of loyal blog readers and quilters everywhere...Hmmm? Think of the quilt shows that could be hosted in the White House, and international shows with quilting ambassadors gathered from all countries..."Love and Peace Through Quilting" would indeed "make America great again"...and all other countries too!!?? So if you are still wondering who to vote for, consider your options and perhaps write my name in that blank spot. It is time for love and peace to reign again and perhaps I could arrange free quilting lessons to whoever wants to learn? Wouldn't we all feel more secure if there were more quilts in the world to pull up and over our heads "when the going gets tough"? 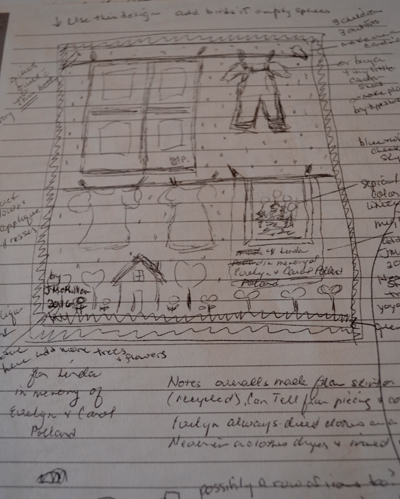 My mother's candle-wicking quilt to be finished next year. A pen and ink "Comfort-Her" quilt block. Next year to be put together. Another block, 49 in all completed for my "Comfort-Her"! 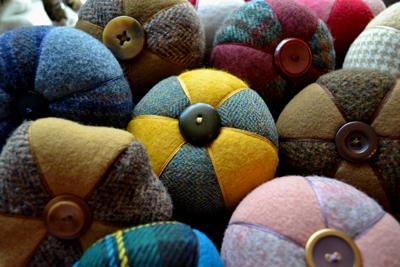 Are all of your pin cushions made of wool? Unfortunately, I'm allergic to wool!